— A cataract is clouding of the lens in the eye. The lens is the part of the eye that focuses light (figure 1). 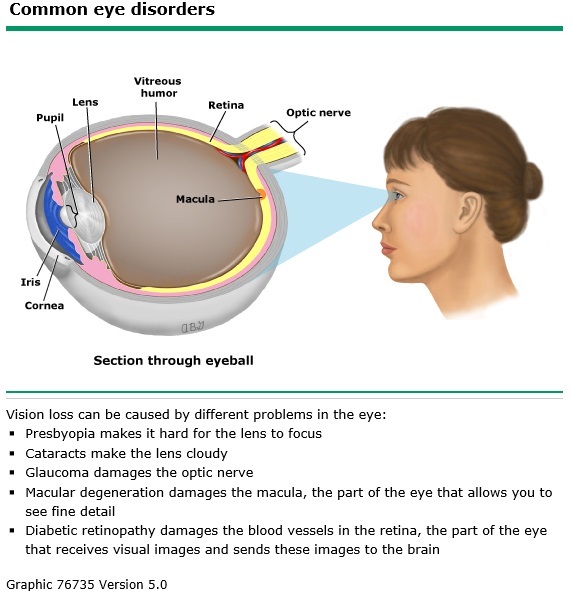 Cataracts can cause vision loss. 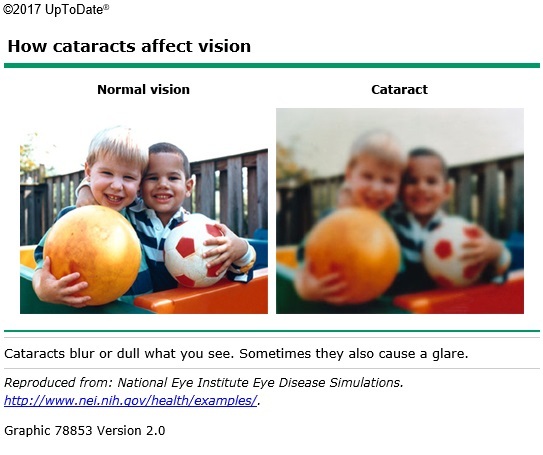 — Cataracts make a person’s vision blurry or dull (picture 1). They can also make everything look slightly brown in color. Some people notice a problem when they keep needing new eyeglass prescriptions. For some, headlights and other lights might seem to have a glare. Is there a test for cataracts? — Yes. Your doctor might be able to see your cataracts just by looking in your eye. But if it looks like you have cataracts, your doctor will probably send you to an eye doctor. Eye doctors can usually diagnose cataracts in minutes. — The main treatment for cataracts with major vision loss is surgery. This involves removing the cloudy lens and replacing it with a new artificial one. Not everyone needs treatment. If you have cataracts, it’s up to you to decide if and when to have surgery. Cataract surgery is pretty simple, but it can rarely lead to problems such as infection or pain. At the same time, the surgery can greatly improve vision in people with severe cataracts. ●How much is my vision likely to improve if I have the surgery? ●Is it possible the surgery will not work? ●What will my recovery be like? 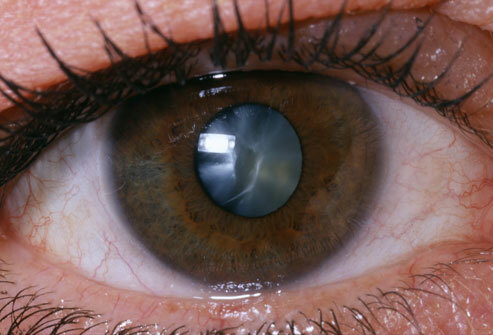 If you need cataract surgery in both eyes, it will usually be done as 2 separate procedures on different days. Your surgeon will want to be sure that you have healed properly from the first surgery before doing the second one. ●How much do my vision problems limit me? ●Can I do all the things I need to do with the vision I have left? ●Have I stopped doing things I love, such as reading or knitting, because I can’t see well anymore? ●How do I feel about the possible risks of surgery? ●How will I feel if the surgery causes problems or does not work? ●Will there be someone who can help me while I recover? Think it over. Then work with your doctor to decide whether surgery is right for you. — You can reduce your chances of getting cataracts by not smoking or quitting if you already smoke.